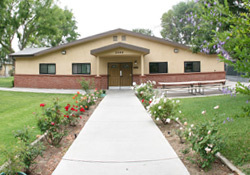 The primary goal of most residents at Rancho is to reunify with family. Rancho’s Aftercare staff provides assistance and support to boys prior to and after they leave the agency as they prepare to rejoin family. Some youth, however, find it necessary to prepare for independent living. Rancho meets the needs of these young men through its’ on-campus Group Home and Transitional Housing Programs (THP). The Group Home Program focuses on development of life skills required for future demands of independent living. Transitional Housing seeks to provide hands-on life experience after a youth has left the care of placement. The Transitional Housing Program (THP) serves young men 18 – 23 years of age that have completed treatment programs and are no longer monitored by juvenile court. These young men live in fully furnished apartments while working in the local community. Participants are encouraged to establish financial security and pursuit of educational goals. Resident staff provide support and guidance to these youth regarding career, financial and social concerns. Residents participate in a rent emulation program called Monthly Housing Deposit (MHD). The MHD is calculated as a percent of net income. The raising percent scale is designed to train participants how to budget for future rental expenses. Monies collected as MHD are refunded to participants upon their departure from the THP. Written contracts detail the rules and expectations all participants must adhere to. The focus of THP is building responsibility and integrity in all aspects of daily living.